I am so grateful to Silhouette America for sponsoring this amazing giveaway and sale! Before I announce the winner, remember, you have through October 24th to take advantage of this sale! 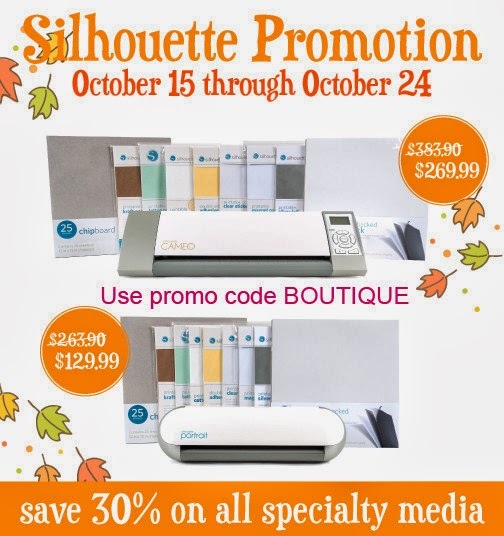 If you already own a Silhouette machine, save 30% on all specialty media. Click here and type in the Promo Code BOUTIQUE when you order to receive the savings. I shared on Pinterest and I shared on my personal Facebook page. Congrats Tammy! Please email your address and contact information to me at lkaisermt@gmail.com so we can send you this amazing machine! Have a great week and stay tuned for a fun new video! Congratulations, Tammy! Enjoy your new Silhouette! Oh my gosh I am beyond exciting!! I just emailed you my information. Thank you so much! Congrats Tammy! I got your email!